Our Club Shack gives actually hospitality to 2 clubs. 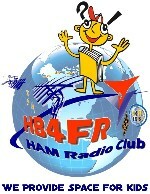 It was built by the "HB9FR - Radio 7 SevenTeam", a group of committed radio amateurs, from which is in principle issued the « HB4FR 'Clin d'Ailes' Swiss Air Force HAM Radio Club ». Our Shack is installed in a Mobilehome, which is located near the Swiss Air Force Museum "Clin d'Ailes" and allows not only efficient radio traffic, but there is also a living room which allows to meet and to socialize.